Samurai DVDs are coming out by the bushel, but the swordplay films of the maker of Kwaidan, Masaki Kobayashi are in a class by themselves. In August Criterion presented us with his superior Hara-Kiri and now comes back with the director's Samurai Rebellion, a stunning emotional achievement. The characters and drama in this one are so good that the story's eventual reversion to a normal sword-fighting conclusion is almost a letdown. 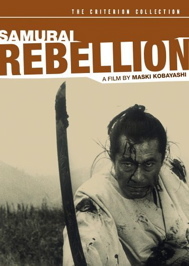 Criterion is presenting Samurai Rebellion separately or as one of four titles in its Rebel Samurai: Sixties Swordplay Classics boxed set. Peacetime in the Matsudaira clan. Samurai retainer Isaburo Sasahara (Toshiro Mifune) is ready to retire and seeks a wife for his son and heir Yogoro (Go Kato). But his ruling Lord forces Sasahara to accept one of his mistresses as Yogoro's bride: Ichi (Yoko Tsukasa) has already borne Lord Matsudaira a son but has created a scandal by striking him. Isaburo resists until his son Yogoro withdraws his objection. To everyone's surprise, Ichi turns out to be a model wife, and she and Yogoro get on excellently, bearing a daughter. But then disaster strikes. The Lord's first-born son dies, making Ichi's child the heir apparent. The Lord decides to forgive Ichi and have her move back into the palace, and doesn't care what the Sasaharas think. Both Isaburo and Yogoro put their foot down - the abuses of the clan have gone far enough. "I won't let her go. Even if it brings fire down on all our heads." Yogoro swears this to the duplicitous court official carrying word that the Lord of the clan has once again changed his mind. By this point in Samurai Rebellion we're ready for a good fight, and it's to the credit of screenwriters Shinobu Hashimoto and Yasuhiko Takiguchi that the film continues to explore issues of honor and justice. Masaki Kobayashi's Samurai Rebellion surprises us repeatedly with its bold portrait of righteous disobedience in an intolerant social system. Isaburo Sasahara's feudal masters have little respect for concerns beyond their own convenience. The beautiful Ichi is treated like chattel not once but three times. She's engaged to a boy she wants to marry, but is powerless when the Lord seeks her as his mistress. Humiliated and angry, Ishi determines to be a faithful mistress and give her master many sons, but finds him with yet another mistress when she returns from the maternity hospital. The Sasahara family is coerced into taking her in even though Isaburo has regretted his own arranged marriage for twenty years. When things seem to have settled, Lord Matsudaira suddenly wants Ishi back again, presenting Yogoro and Isaburo with threats carefully worded as requests. The two men choose the difficult path, earning the scorn of their own extended family. When he openly rebels, Isaburo states that he's found a rebellious purpose in the love between his son and daughter-in-law. Relations between the Sasaharas and their sworn masters become a battle of entreaties and stubborn refusals. At one point Isaburo's trusted friend Tatewaki Asano (Tatsuya Nakadai, the star of Hara- Kiri) is instructed to kill Isaburo, as only he has sufficient skill to fight the master swordsman. Tatewaki points out that he's a border guard, not an internal law enforcer, and that if they want him to do that job they'll need to promote him. He delays fighting his friend, but the two will later have to face off just the same. Everything is obligation. The honorable characters stay true to their vows and make sacrifices when one obligation conflicts with another. The unscrupulous Lord Matsudaira makes cynical use of his influence and abuses the loyalty of his vassals. There are at least four verbal standoffs in Samurai Rebellion that have the power of a 'fighting words' oath in a western. Outraged to the point of apoplexy, the palace representatives come to Isaburo with a happy solution to the standoff: The Lord generously grants both he and his son permission to commit Hara-kiri. Isaburo has a response ready: Thank you for the honor. We'll be pleased to do so when you deliver us the heads of the Lord and his two key henchmen. With such a dynamic conflict in place, it's slightly disappointing that Samurai Rebellion resolves with an expected bloodbath and a tense duel of honor. Once the Ichi character passes from the story, it's essentially over - her unifying spirit inspired Yogoro and Isaburo to resist injustice. The well-done ending battle scenes are generic content compared to the brilliant and suspenseful storytelling that's gone before. Criterion's DVD of Samurai Rebellion is a fine enhanced transfer of this handsomely shot B&W movie. The Tohoscope film was co-produced by its star Mifune. It comes with good liner notes from expert Donald Richie and a short excerpt from a 1993 interview with the director.